Fresh corn salad is a perfect, refreshing side dish during the summer months and at 130 calories per serving is a great pairing to along with burgers, sandwiches, and more. 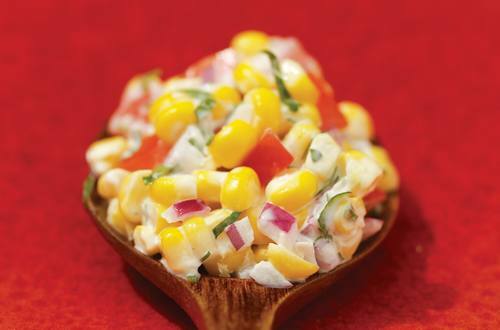 Try this corn salad with light mayo today! 1 In medium bowl, combine all ingredients. Season, if desired, with salt and ground black pepper. Serve chilled or at room temperature. *Substitution: Use 20 oz. package frozen whole kernel corn, thawed and cooked.